James, Marc and I were chatting about the potential of Warhammer 40K 6th edition last night. Based on the rumours about strategic reserves, high speed vehicles being hard to hit, tanks being easy to hit and the overall toning down of cover saves, there would be some clear winners in the new rules. Eldar, Dark Eldar and Tau were two armies which instantly sprang to mind due to their tactical flexibility and mobility. Charging forward screaming "SPESS MARHEENS!!" is getting old now. Even Marc is tired of his (frankly disgusting) Grey Knight Draigo Paladin army of doom. The buzz about 6th edition seems to have died down lately, possibly as a result of GW tightening its grip on rumours and strategic leaks of information to whip the gaming community into a frenzy. But let's consider for a moment what it would mean if cover saves were reduced to 5+ instead of 4+. Well for starters, we'd be able to kill things with shooting more effectively. Especially if they're tanks. So right now a Land Raider packed full of Assault Terminators is sent speeding across the board. Everything bounces off it, misses or can't see it because of the smoke and terrain. Then the Terminators get out and every gun under the sun bounces off their armoured backsides and great big shields before they batter everything to death with enormous electrified hammers. But what if you only need 2+ to hit that enormous monster of a tank? What if the best cover save it can get is 5+? Then the strategic arrival of a Hammerhead with a Rail Gun could easily take it out. Just like it was almost guaranteed to back in 4th edition. Similarly, mobile armies could arrive from reserve, get the first shot in and nail an enemy tank just like that. That would dissuade army builds entirely of metal boxes that speed across the board. In the meantime, we can only keep an eye out for the next edition and pray for something more tactical than the 'point-cost-efficiency' way of winning games...and a new Tau Codex of course! Even though I've been playing Space Wolves for a few years now, I really miss my Tau. My real hopes for 40K? That the Dexes would be even and that fluffy was powerful. Even when you look at C:SW, that Blood Claws are the same points as Grey Hunters is just bonkers. If they balanced the game so that there wasn't a clear choice for an army build, and that Bob the fluffite didn't get pwned for trying to play out the stories he reads, would be my current dream for 40K. I think 40K would be better if Rhinos were actually at their old cost, like in C:BT. That way they wouldn't be auto includes, and you'd be missing out on other stuff if you did want the spammed safety of metal bawkses.... SINDRIII! While yes, cover saves are not hard to get, at least we have markers to make our few weapons count. Also, a skilled tau player ALWAYS tried to get a cover save for his suits...otherwise we are just a single missile/las/melta shot away from instant death (T5 please!!!!). Finally, brush off that cadre! 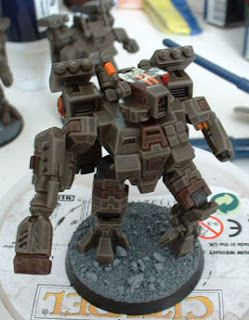 I have been playing tau through the dark times...and while it is an uphill battle, the suits still hang in there. Sure, they are not forgiving at all, but do alright (GK are actually not bad at all, DE...now thats a rough fight!). It's probably too little, too late for me. I easily have 6k of Tau and all I've ever wanted from those marketing geniuses at GW is a decent updated FAQ. They desperately need to rework 40K's mechanic from the ground up to get me worked up about a new edition much less a new codex. GW is hemorrhaging customers and all they can come up with is a 'Gilligan's Island' boxed set instead of spending time working on FAQs?!?! I'm going to stick with Infinity till they get it right (like that will ever happen). This would be a vast improvement over the current system. I've stopped playing 40k (despite 4 armies and working on 5th) and have stopped modelling altogether (its harder to get the gigs now I'm 30+, who wants catalogue eh?). I haven't played Tau in ages despite adoring the whole scene, The last tournie I played I got rolled up by spammed terminator armies (one being the paladin sucky cheat-fest) ... and it kinda turned me off. Get me right, as a guard player, I LOVED the 4+ cover save, it stopped guard armies melting like butter ... but Smurfs are already too hard and plasma too expensive. I'm tired of fighting "you can't hurt me" armies with 2+, 3++, I6 and AV14 boxes. 40k always been too smurf friendly, and right now - it's only the smurfs worth playing. You should try out more list, i find more and more combos to be very usefull, many ways to play it. at first i tough that the Tau couldnt stand much chances against other V5 armies, but ... i find myself always winning against my friend who is a veteran IG player with barely any losses in an almost total annilation :D.
Just never give up the greater good! and he will never let you down. my favorite tau ,oment was when my freind who plays SW chrged 5 scouts into a 6 man squad of fire warriors, the combat ended with all scouts and only 3 firewarriors dead. you should of seen his face! Regarding cover saves, there is one thing I don't understand; don't you people take marker lights? Start Building Your Tau Now!